Taming the beast is the theme of the Strength card. Soothing nature's savagery is visualized by typically showing a fair maiden subordinating a lion who is under her spell or dominion. Other times the card has a more literal interpretation and simply shows a strong man doing strong guy stuff like flexing his muscles or performing a herculean task. Below you can view the various artistic interpretations of the Strength card. Strength is spiritual muscle power. Real strength is the fluid ease that comes from long, devoted practice. It is the perfect equilibrium between love and power. It is skillful, gentle, relaxed, and graceful. The flexible athlete bends and sways in the storm. Love is strength. The red roses and the maiden symbolize love. Perfect innocence, completely guileless and unafraid, is strength. The strength of pure love. Real love. Mature strength is acquired through self-imposed discipline. 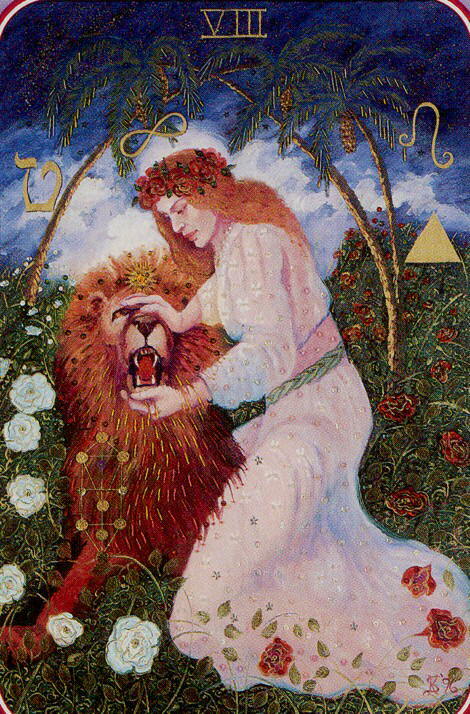 The lion represents sexual energy under control. It must be managed with great delicacy, enabling it to be a constructive force. Our spiritual self must gain mastery over our raw vital energy. Heart, mind & body must work together. Mind & heart over matter. Strength without love is ignorant brutality. Love without strength is weak sentimentality. The powerful lion is confident that no enemy can harm him. Strength is the confidence that you can deal with whatever comes. When you can center yourself at will, you have true strength. Do you know this kind of strength? How do you nurture and preserve your strength? What kind of skills are you building? Are you moving forward with courage and confidence?